Wander through a well-funded museum these days and you’re likely to find interactive exhibits scattered around, such as this sleek 50″ projection-based multitouch table. The company responsible for this beauty, Ideum, has discontinued the MT-50 model in favor of an LCD version, and has released the plans for the old model as part of the Open Exhibits initiative. This is a good thing for… well, everyone! The frame consists of aluminum struts that crisscross through an all-steel body, which sits on casters for mobility. The computer specs seem comparable to a modern gaming rig, and rely on IEEE1394 inputs for the cameras. The costs start to pile up with the multiple row of high-intensity infrared LED strips, which can run $200 per roll. The glass is a custom made, 10mm thick sheet with projection film on one side and is micro-etched to reduce reflections and increase the viewing angle to nearly 180 degrees. The projector is an InFocus IN-1503, which has an impressively short projection throw ratio, and a final resolution of 1280×720. When we see artists like Daft Punk or Madeon working their magic in a live setting, we’re always impressed with their controllers. Sample-based artist use controllers like the Monome and Kaoss Pad a lot, but these devices are fairly expensive. 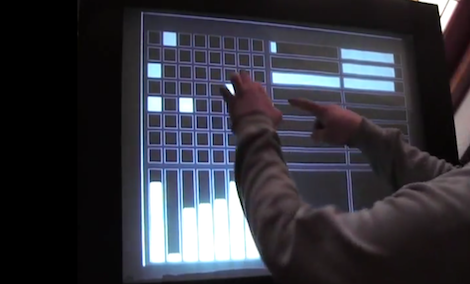 Thankfully, we live in an age of multitouch displays, so [Graham Comerford] came up with his own multitouch controller that does just about anything. The build is based on the Kivy framework and includes a Monome emulator, MIDI drum pads, mixer, and a whole bunch of other sliders and buttons. There’s no word on how [Graham]’s multitouch display was constructed, but if you’re looking to build your own gigantic audio control setup there’s a lot of info on building Microsoft Surface clones, adapting computer monitors, and spherical multitouch rigs. We’re not sure if [Graham]’s virtual drum kit is velocity sensitive but even if it’s not, it’s an interesting bit of kit. Check out an earlier version of his setup after the break.